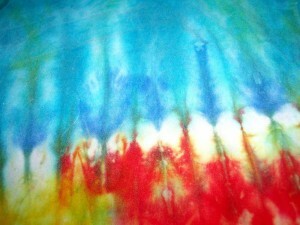 Bring your own t-shirt, or other white item, and fill it with fabric dye! B.Y.O.T. Tie Dye Summer Event with be Friday, 7/3/2015, from 6:00 – 9:00 pm in the upstairs arts and crafts area, a free event for members. A 100% cotton item works best such as a clean t-shirt, socks, a hat, apron., etc. Washing items is helpful if they are newly purchased but avoid fabric softener, which is oily and repels dye. Twelve bright colors in easy applicator bottles and all other materials will be provided for you to hand color your item.